Until recently, Kylie Jenner was holding the record for the most liked Instagram post. But her record was beaten – by a random stock photo of an egg! The photo passed Jenner’s 18 million likes earning almost two times as much, and counting. After hitting the record revenue of $1.84 billion in Q3 of 2017, Adobe has done it again. They broke another record and reported $2.08 billion income in Q1 of 2018. Although many photographers are unhappy with the subscription-only model, it seems Adobe is still doing just fine. Even more than fine. This time last year we wrote about the mind-blowing 8-terapixel 360-degree interactive virtual tour of Dubai, simply called Dubai360. Celebrating the 1 year anniversary of the incredible project, Gerald Donovan has updated his famous Burj Khalifa pinnacle shot. The new image, and largest ever taken in Dubai, is 45 gigapixels in size and offers improved visibility. The record for the highest capacity MicroSD card was smashed and surprisingly the card was not revealed by SanDisk, but rather by a company called Microdia – located just a few stands away at the Computex tradeshow. The Microdia Xtra Elite will use version 4.0 of the Secure Digital standard, meaning it will have an additional row of pins on the back of the card. Thanks to this extra row, the Ultra High Speed (UHS) bus will be capable of reaching data transfer rates of up to 300MB/s. Older devices, not supporting the SD 4.0 standard and its second row of pins, will still be able to use the card at maximum speeds of approximately 150MB/s. Conservation movement Freedom Conservation successfully set a new world record for the highest recorded bird flight from a man-made structure, with the help of an Imperial Eagle called Darshan. 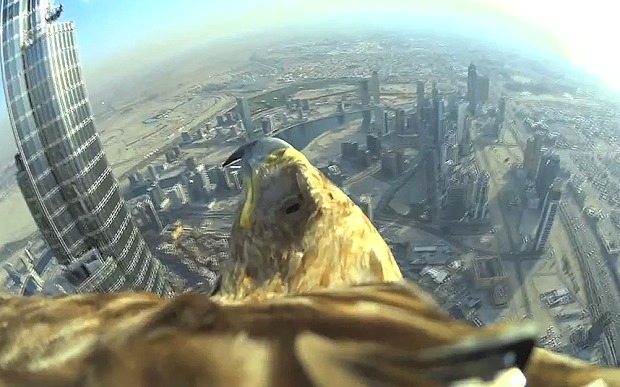 The flight, starting at the roof of the Burj Khalifa, was documented by attaching a Sony 4K Action Cam to the eagle. Hoping to raise awareness of the plight of threatened wildlife, the group’s eagles have flown from several iconic landmarks in the past such as the Eiffel Tower in Paris and London’s St. Paul’s Cathedral. Light painters have many cool tools and techniques at their disposal allowing them to create various shapes, lines and colors. One of my favorite shapes is the light orb, so needles to say I was happy to see so many of them in one photo. The East Coast Light Painting group set a Guinness World Record after they had successfully created 200 complete light orbs in a single exposure. Light painting seems like an advanced form of magic if you don’t know how it’s created, so to anyone unfamiliar with light paining this photo will probably look like an alien nesting area. If you have ever tried light painting though, you will appreciate the crazy amount of effort ad precision required to pull off such a feat. Most people get married once, maybe twice, but Alex Pelling and Lisa Gant are about to get married for the 67th time. Having gotten married so many times, and in over 50 countries, this couple probably holds the record for the most wedding photos.